Parmanu is the story describing how India dramatically declared itself as a full fledged nuclear power on the world stage by testing 5 nuclear bombs in 1998 , surprising the whole world . Eventually India's nuclear weapon status was legitimized by a nuclear deal with the USA , which proves the hindi maxim 'duniya jhukti hai , bas jhukane wala chahiye' which means 'the world will bend for you , if you have someone with the will to make it bend for you' . In this case the 'someone' was India's prime minister Atal Bihari Vajpayee , and the team of scientists which carried out the tests was led by Dr A P J Abdul Kalam . The story begins with an IAS officer Ashwat Raina ( John Abraham ) suggesting in a high level government meeting that in response to China testing it's 43rd nuclear bomb , India must respond by testing it's own nuclear bomb . This is in 1995 . Against scepticism by others , this plan is implemented by the government but without Ashwat's involvement . Ashwat had chalked out an elaborate plan to avoid the watch of American satellites , but that is disregarded . So the preparations for testing come to the notice of American satellites in space and America raises a hue and cry about the impending tests , due to which they are aborted . Ashwat is suspended from his job and is forced to retire to the hill station of Mussourie . But in 1998 a new nationalistic government led by the BJP comes to power , and Ashwat is reassigned to the job of leading a team to test nuclear bombs in Pokhran in the desert state of Rajasthan close to Pakistan . His main contact with the PMO is Himanshu Shukla ( Boman Irani ) who is principal secretary to the PM . Ashwat selects a team of military professionals and scientists who are given code names from the hindu epic Mahabharata . The biggest challenge in front of the team is to make preparations for the nuclear tests without the americans knowing about them . So they have to work in times when the American satellites are not watching them---known as blind spots . Before the satellites see them , the team and the military personnel assigned to them have to cover their tracks . The preparations go on for several days , so this has to be done repeatedly---a challenging task indeed . Sand storms in the desert create their own problems which have to be dealt with . The other challenge is to avoid being detected by American and Pakistani spies at Pokhran . Here the director takes the cinematic liberty of making the Pakistani spy interfere in Ashwat's personal life by making his wife ( played by Anuja Sathe ) suspect that he is having an affair with a female member of his team ( played by Diana Penty ) . Needless to say , this is all fiction though it does heighten the entertainment quotient of the film . A totally filmy fight is shown between Ashwat and the Pakistani spy . None of this really happened in real life and is shown for increasing the drama in the film . As the Indian flag flies tall in the aftermath of the tests near the test site and the soldiers stand to salute it , you cannot but feel a sense of pride and thrill of patriotism . The emotional music score does heighten your feelings at this point . Acting is good by everyone and so is the background music . Songs are good too , though they are mostly in the background . Photography is decent and so are the colours . The movie will be understood mostly by the educated audience and is not for the masses . It is of course a must see for all nationalists of whom I am one . 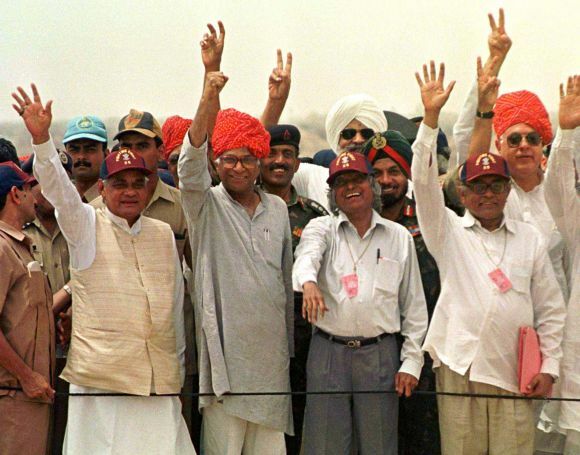 is this one to remind all the Modi Bhakts that there was also Atalji once? And then weer them towards Congress. Anyway, why watch a movie for something i had followed so closely during those days. Lee Kuan Yew mentioned that 'India had missed the bus' in 70s and 80s when Singapore, SK and taiwan became 'Asian Tigers'. India did not miss the bus in 90s when US companies were spending a lot of money to overcome the Y2k problem. Many Cybercoolie cos built themselves using this. Thus, the timing was perfect. US cos had too much of stake from cheap indian cybercoolies to tackle the Y2K timebomb. There was a lot of Hue and cry but it all petered out. Partly by now suspended and comatose Jaswant singh lobbying with strob talbott to end Indias nuclear isolation. One element of secrecy was also distracting the attention of US intelligence to other sites. And until then, Pakistan used to boast of a better life for its denizens than India. Looks like the roads were cleaner and there were not as many beggars as in India. But after Pak had its own version of Pokhran, it could not withstand the international sanctions like India and since then it became a basket case. The tejas light combat aircraft program did suffer as Americans stopped crucial technology transfer needed for the project . But otherwise India was able to weather the international criticism pretty well . Caught this one on Netflix. The plot is crisp and maintains the suspense in a tight cricket match fashion. Excellent performance by John Abraham and Boman irani. Here the director takes the cinematic liberty of making the Pakistani spy interfere in Ashwat's personal life by making his wife ( played by Anuja Sathe ) suspect that he is having an affair with a female member of his team ( played by Diana Penty ) . Needless to say , this is all fiction though it does heighten the entertainment quotient of the film . A totally filmy fight is shown between Ashwat and the Pakistani spy . None of this really happened in real life and is shown for increasing the drama in the film . Last edited by sgars; December 25th, 2018 at 05:47 PM. I have seen a portion of the movie. I liked it. About the later part of your post, that would be hillarious. One thing that caught my attention at the end of the movie was a pic of Farooq Abdullah at the site. He used to be a Union minister in NDA those days. I found a similar pic below. I think the movie showed him without a pagri.